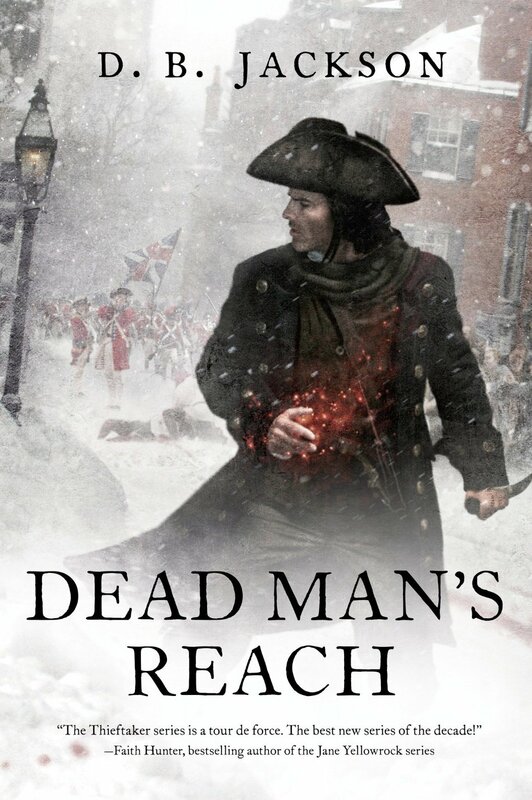 DEAD MAN’S REACH, his latest Thieftaker novel written as D.B. Jackson, which Bookish chose as one of the Week’s Hottest Releases: 7/19-7/25. HIS FATHER’S EYES, second book in The Casefiles of Justis Fearsson, which Kirkus Reviews named one of The Must-Read Speculative Fiction Books Coming Out in August. Many thanks to Lucienne for hosting me; it’s great to be here. I am just completing what may be the busiest phase in my eighteen years as a professional writer. 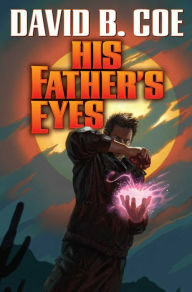 Two days ago, Baen Books released HIS FATHER’S EYES, the second volume in The Case Files of Justis Fearsson, a contemporary urban fantasy I’m writing under my own name. Two weeks before that, Tor Books released DEAD MAN’S REACH, the fourth book in the Thieftaker Chronicles, which I write under the name D.B. Jackson. And during the course of this summer I have also had three short stories published, all while attending conventions and teaching at writers’ workshops. As any author knows, busy is good, and I have been very fortunate. The Fearsson series began with SPELL BLIND, which came out in January of this year. It’s a departure from my previous work in a couple of ways. It’s my first contemporary work. The Thieftaker books draw on my history background and are set in pre-Revolutionary Boston, and the epic fantasies I published before I began to write historical fantasy were all set in medieval worlds. The Fearsson books, on the other hand are set in modern day Phoenix. My magical private investigator hero drives a car and carries a firearm. He uses a cell phone and a computer, he speaks like you and I do, he swears occasionally, he has a girlfriend, he likes jazz and baseball and Mexican food. In other words, after writing point of view characters whose lives barely resembled mine at all, I finally have a protagonist I can relate to on all sorts of levels. Which may be why Justis Fearsson — Jay, for short — is also the first point of view character for a novel that I’ve written in first person. When I started in the business, writing in first person point of view was frowned upon. Editors didn’t like it, so writers tended to stay away from it. In more recent years, though, with the success of first person novels (Patricia Briggs’ Mercy Thompson books, Jim Butcher’s Dresden Files, Faith Hunter’s Jane Yellowrock books, C.E. Murphy’s Walker Papers, Susanne Collins’ Hunger Games books, just to name a few) this has started to change. The truth is, I love writing in first person. I wouldn’t want to do it with all my books. It wouldn’t work in a big epic fantasy, with multiple point of view characters, nor was it the right choice for the Thieftaker books. For those, I chose close third person, which provided just enough narrative distance between protagonist and reader to allow me to explain key historical elements. These moments of brief exposition would have sounded awkward in first person. With the Fearsson books, though, there is less to explain. And the intimacy of the first person narrative draws my readers in, allowing them to experience all that Jay experiences. This is particularly important for this series, which has an unusual magic system. Jay Fearsson is a weremyste. He is a runecrafter, who can cast a variety of powerful spells. But every month, on the night of the full moon and the nights immediately before and after, he goes temporarily mad, even as his power grows. So at the exact moment when he most needs to control his magic, he is least capable of doing so. Eventually the cumulative effect of these moon phasings will drive him permanently insane, as they have his father, who is also a weremyste. The moon-induced madness that Jay goes through in the books would be compelling in any narrative voice, but in first person the phasings become a viscerally harrowing ordeal, which is exactly what I want. In addition, the immediacy of first person POV enhances the dramatic impact of Jay’s investigations of magical murders, enabling my readers to share in his discoveries and to experience “first hand” the twists and turns my plotting. We writers have many tools at our disposal: metaphor and simile, dialog and internal monologue, misdirection and foreshadowing, to name just a few. To my mind, point of view is the most powerful. Using the perspectives of our POV characters — their emotions and perceptions and intellects — we guide our readers through our narratives, showing them not only what happens, but also the potential meaning of each new event. Point of view is, in essence, the point where narrative and character arc intersect. This is why the choice of the proper narrative voice is so important. The Fearsson books would work in third person, rather than first, and I could probably rewrite the Thieftaker books in first person and they would remain good reads. But for reasons I’ve already covered, those are not the voices I chose for the two series, and I believe strongly that both set of books work best as written. As writers we should be deliberate in choosing the proper voice for each story. We shouldn’t choose third person simply because the market might prefer it, as once it did, nor should we automatically gravitate toward first person just because that voice is in vogue right now. Rather, we need to consider several factors in choosing the right POV voice and, for that matter, the correct point of view character. Whose story are we telling? Is that person the logical choice to tell the story, or should it be told by someone close to that character? (See Jack Kerouac’s ON THE ROAD.) Do we need several POV characters to tell the story effectively, or will one do? Will first person be the best choice, or will it be distracting? Does the amount of exposition we’ll need necessitate a third person approach? These are the questions I ask myself when I begin a new project, either novel length or shorter. I would suggest that you ask yourself similar questions as you begin your next project. You might find that doing so helps you make optimal use of a powerful narrative tool.